High above the confluence of Zayante Creek and Mountain Charlie Gulch sat the eponymous Zayante Station. Unlike most other stations along the former South Pacific Coast Railroad grade between Los Gatos and Santa Cruz, this location lived through three entirely different lives before quietly disappearing from memory. In fact, when it first appeared, it was not called Zayante at all! 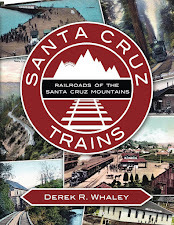 The station probably existed from the very beginning, around 1879, as an informal flag-stop for employees who worked at the Santa Clara Valley Mill & Lumber Company (Doughertys) mill far below the railroad grade. Although the railroad had its own stop a mile to the south, that catered primarily to freight transfers onto the spur to the mill. It was much more convenient for work crews to trudge up the double switchback road to the grade and flag down a passing train. At the time that the mill closed and the Southern Pacific Railroad took over the line, both events occurring in 1887, there was still no formal recognition of a stop at the top of the switchback. Such a location only appeared in the February 1891 stations book under the name White Flag Spur, a lazy name that says much. Although the purpose of a spur at the site in 1891 is unknown, the existence of a white flag indicted that people could flag down a train here. It was a probably a name for the stop that had been used informally for over a decade but was only picked up by the Southern Pacific after it had completed the takeover of the former South Pacific Coast properties. 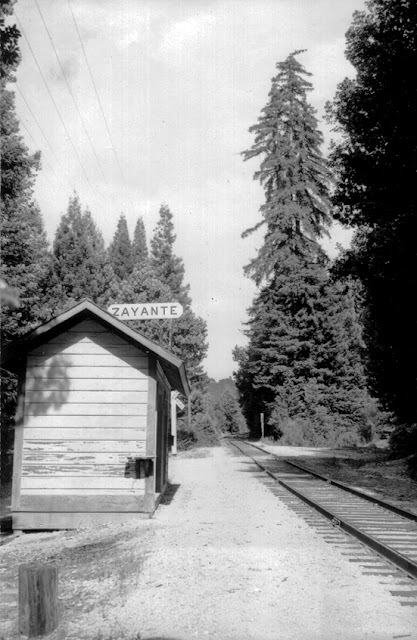 The name Zayante, a reference to the Ohlone Native American tribe that had once inhabited the San Lorenzo Valley, was not immediately attached to this location due to a naming conflict with another station further to the south. In 1890, Southern Pacific had renamed the old Dougherty's Mill station "Zayante," since the mill had closed and the term was anachronistic. But in 1891, the railroad added a new stop 0.4 miles to the south under the name "Doughertys Spur," while retaining Zayante as the name of the nearby station. 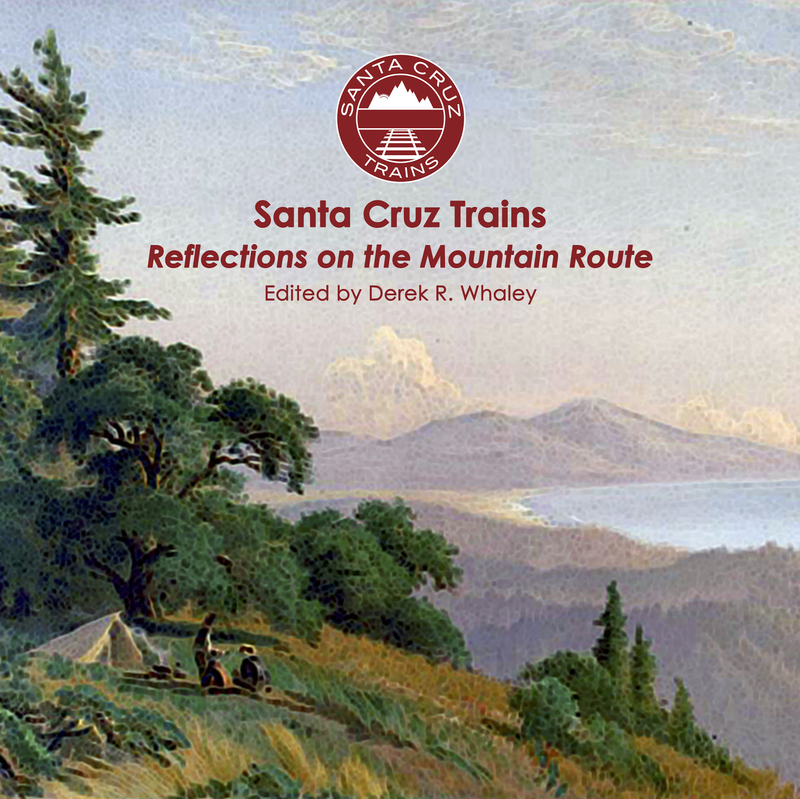 By July 1892, the station name had become Meehan and White Flag Spur was designated Zayante, a name it would retain for the next forty-eight years. For the next decade, Zayante lived out a meager existence as a flag-stop far removed from any significant settlement. A few houses may have been located on the former mill site below the station, but there is no evidence for other homesteads in the immediate area. However, the switchbacked road that went to the grade continued to the top of the hill, from where it could reach Glenwood and Scotts Valley, suggesting the stop may have been situated at a convenient shortcut between the Upper Zayante-Summit area and the Branciforte-Bean Creek highlands. Later photographs of the stop consistently show a grade crossing beside the station, suggesting at least infrequent use of this shortcut. The spur implied by "White Flag Spur" may have serviced local farmers who needed a place to ship out goods, although no actual evidence for this exists. When the location finally was registered as a full station in December 1905, the spur was noted as being 315-feet-long, a not insignificant length that could park a number of passenger or freight cars. One thing is certain regarding Zayante: it was the only station in the area with direct vehicular access, albeit via a very steep switchback. 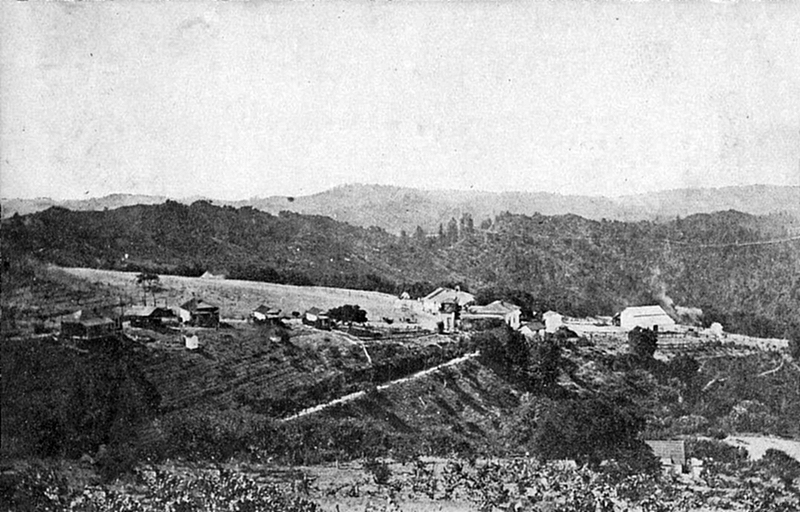 Gibbs Resort on the top of the ridge over the railroad grade, c. 1910. Following the 1906 San Francisco Earthquake and the subsequent standard-gauging of the line, the spur at the station was lengthened to 400 feet. This expansion of the station's infrastructure was inevitably due to the opening of Gibbs Resort located far up on the ridge. Alfred W. J. Gibbs had owned the large, sandy, chaparral parcel since at least 1878 and leased a tiny portion of the property to the South Pacific Coast for use in the railroad's right-of-way. It was probably Gibbs who first connected the switchback at White Flag Spur through his own property to Mountain Charlie Road (later Glenwood Highway / Drive). A current resident of the resort property claims this road was named Alameda Boulevard, after the railroad's northern terminus. Portions of this route were upgraded in the late 1990s for use as a fire road for local residents. When Gibbs first opened his resort is not entirely known, but on November 28, 1900, a post office opened at his ranch under the name Gibbs. From 1900 to 1906, the post office operated continuously, and it ran seasonally until 1916. The ranch thrived on its rustic nature, although it also had a great view of the Monterey Bay. It was primarily a campground and supported with a general store and post office, a cookhouse, a dance hall, and cabins. The photograph above also shows a home and a barn, probably both for Gibbs's personal use. The railroad also increased its support for the resort, installing a small station shed beside the tracks and road in 1901. Gibbs personally ran a stage coach between the station and the resort throughout this time. Gibbs appears to have closed in the mid-1910s. The post office relocated in 1916 to some other location, possibly another small resort in the area. There is no evidence that a post office or commercial structure was situated at Zayante station itself, although a mailbox is often shown beside the station shelter, which probably still served as the postal distribution point. Wherever the post office was located, it finally shut its doors in April 1938. The spur disappeared from station plats of Zayante around 1909 but continued to be listed on timetables until 1930, so its continuing existence is uncertain. Photograph evidence proves that it was gone by the late 1930s. By 1936, the station served only 10 local families, although there was continuing traffic to the stop provided by local resorts, such as Camp Wasibo, run by the Camp Fire Girls. The remote location and the severe decline in rail traffic through the 1930s actually contributed to Zayante's final moment of glory. In the spring of 1937, the Universal Film Company and Hollywood glitterati descended upon Santa Cruz County to film an action movie deep in the mountains entitled West Bound Limited. Hotel Palomar in downtown Santa Cruz became the temporary home of celebrity director Ford Beebe, famed art director Ralph DeLacy, associate producer Henry McRae, and popular actor Lyle Talbot. Other actors, such as Henry Hunter, Polly Rowles, Henry Brandon, and Frank Reicher, joined them, spending their free time at the Boardwalk and other local sites. Zayante Station was chosen as the primary location for external scenes due to its remoteness, the nearby sounds of rushing water, and ease of accessibility. 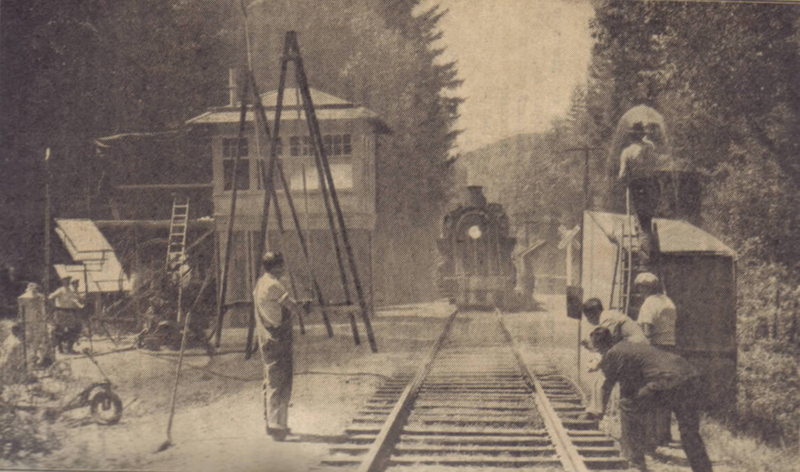 A special studio train brought in production materials and shuttled the crew and actors from Santa Cruz to Zayante, where a temporary station structure was erected across from the actual Southern Pacific shelter. Interior scenes were filmed at Felton Station, while others scenes were completed at Big Trees, Olympia, and Inspiration Point on State Route 9, all along the track. Production lasted roughly a week and involved the studio borrowing a passenger and a freight train from the Southern Pacific. Al G. Hemmerstram from the railroad remained on site to ensure the authenticity of all railroad scenes. The film follows the story of Dave Tolliver (Talbot), the local railroad agent for the fictional town of Hargraves, who is hoodwinked by a man posing as a corpse who then steals the Bonanza Gold Mine payroll. Tolliver tries to retrieve the payroll, but unwisely abandons his post in the process, resulting in a deadly railroad collision. He is imprisoned for manslaughter but escapes, after which he eventually exonerates himself in a story of mystery, suspense, and romance. Production was hampered by intemperate weather, a low-flowing stream, and numerous landslides along the tracks. Additionally, a special lightning effect nearly exploded unexpectedly, but Talbot and Beebe were able to defuse it before it injured or killed any of the nearby and unaware crew. Zayante’s remoteness kept down the usual number of visitors to the filming location, but dozens of local extras were employed in scenes in Felton and elsewhere. Filming wrapped on May 3, only days before a Federated Motion Picture Crafts strike was scheduled to begin. Cast and crew were feted at one final well-attended dinner at Hotel Palomar before heading back to Hollywood. The film premiered in Santa Cruz on July 11, 1937. Following completion of filming at the site, Zayante formally remained in operation until March 1941, although the railroad route had unofficially closed after the disastrous winter storm of February 1940. The shelter was presumably scrapped and the site abandoned. The site of Zayante Station is accessed at the top of the switchbacked City of Santa Cruz fire road located at the confluence of Zayante Creek and Mountain Charlie Gulch. Trespassing is not encouraged, although it is also rarely enforced. The actual shelter location is still quite visible beside the former right-of-way on the creek side of the fire road. The fire road to Weston Road, formerly the road to Gibbs Resort, is directly across from the station site behind a gate. 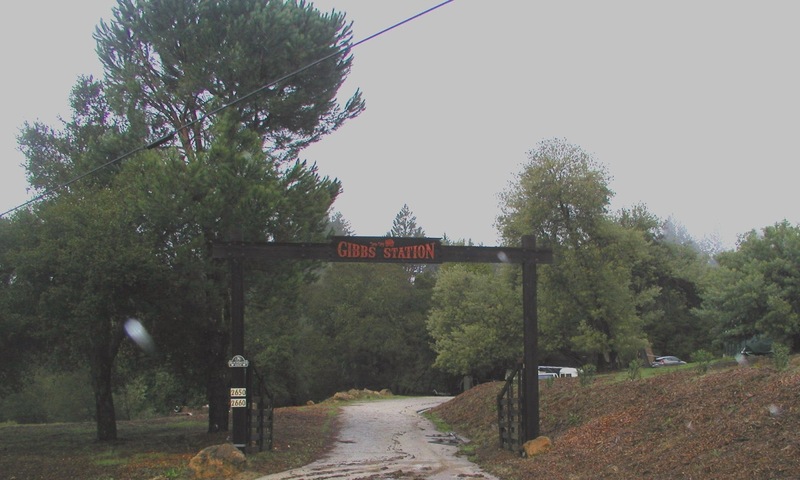 At the resort itself, only the original cookhouse survives, although it is now used as a private residence that goes by the name "Gibbs Station," as stated on its entry sign. DVD copies of West Bound Limited are available at the Henry Cowell Redwoods State Park store. Clark, Donald Thomas. Santa Cruz County Place Names: A Geographical Dictionary. Scotts Valley, CA: Kestrel Press, 2008. Hamman, Rick. California Central Coast Railways. Second edition. Santa Cruz, CA: Otter B Books, 2007. Santa Cruz Sentinel, 1900 to 1937.
edit: Change "indicted" to "indicated", and, as long as you're on that line, remove the misplaced "a" in "It was a probably...."